If you're in the market for Personalized Dominoe Sets the Alex Cramer website is your one stop destination for Personalized Domino sets. On our Personalized Dominoes sets, you can request to place a custom message on the case or even customize the dominoes with a custom logo or message. Our Personalized Dominoes sets you receive 28 indestructible Double Six Dominoes. Our Personalized Domino Set have an ivory-look and smoothly rounded corners with gleaming black dots. Our Personalized Dominoes Sets are have a lifetime guarantee against domino breakage or loss. Whether you're looking for a Personalized Domino Set or just a set to have at your home and office we offer the top-of-the-line-product. 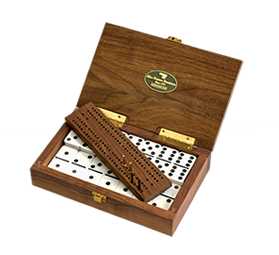 Our Personalized Dominoes Sets come in a beautiful American-made hand-crafted solid Black Walnut Case. The Personalized case features a brushed brass closure and brass hinges. The box features a brass engraving plate. Our Personalized Dominoes Sets are a great gift for any occasion including company gifts, birthdays, Father's Day and more... You don't have to worry about whatever surface you store your Personalized dominoes set on because our Personalized Dominoes case comes with a no-scratch felt bottom. Our Personalized Dominoes and Black Walnut Case come packed in a sturdy and attractive leather- finish gift box. We offer Personalized Dominoes sets with standard and tournament size dominoes. Standard Personalized Dominoes are different dimensions than the Personalized Dominoes sets. The Personalized Dominoes sets come with a slightly larger American Walnut Case. 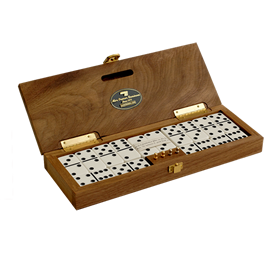 Both Standard and Personalized Dominoes set come with the option to engrave the brass plate box. Both Personalized Dominoe sets we offer stand out among competitors in the industry. There are many different ways to play with our Personalized Double Six Dominoes Sets. Our Personalized Domino sets come with 28 Dominoes. There are countless different games to play with Personalized Dominoes Set and many variations within those games. With our luxury Dominoes you literally, have endless games at your fingertips. Our Personalized Dominoes sets also come with instructions to teach you how to play different games. Our website even features a page that has instructions to play with your Personalized Dominoes Set as an added bonus! 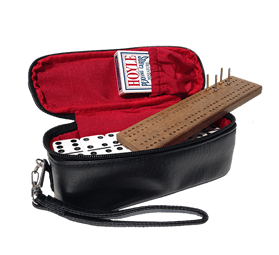 Whether looking for Personalized Dominoes to play a standard game of Dominoes or looking for Personalized Dominoes Sets you've come to the right place. 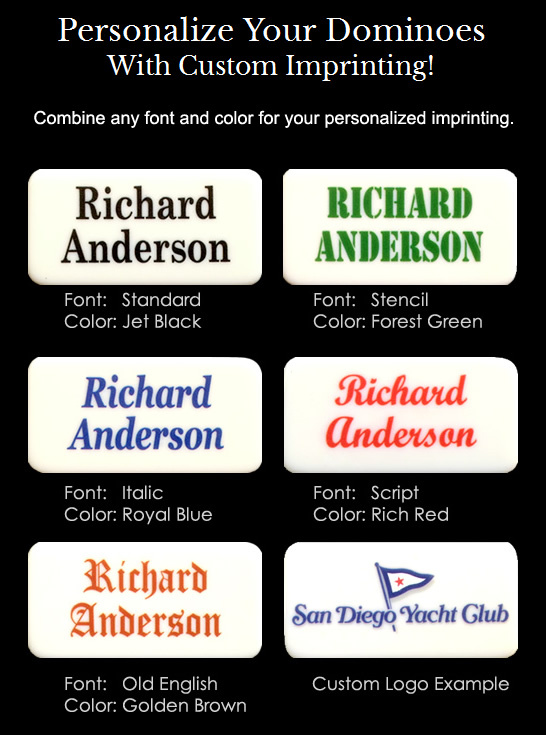 With our Personalized Domino Set 100% Satisfaction is guaranteed or your money back. We stand behind our Personalized Dominoes sets and are proud of our product. We want to provide you with the best online shopping experience and customer service available when shopping for your Personalized Dominoes. If you are shipping one of our Personalized or Personalized Double-Six Dominos Sets sets to a friend we even offer FREE gift wrapping and a handwritten card. 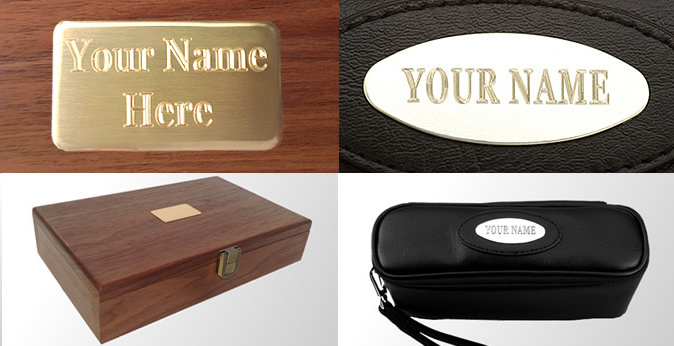 With our custom brass plate you would be sending a gift that would be remembered and last a lifetime.